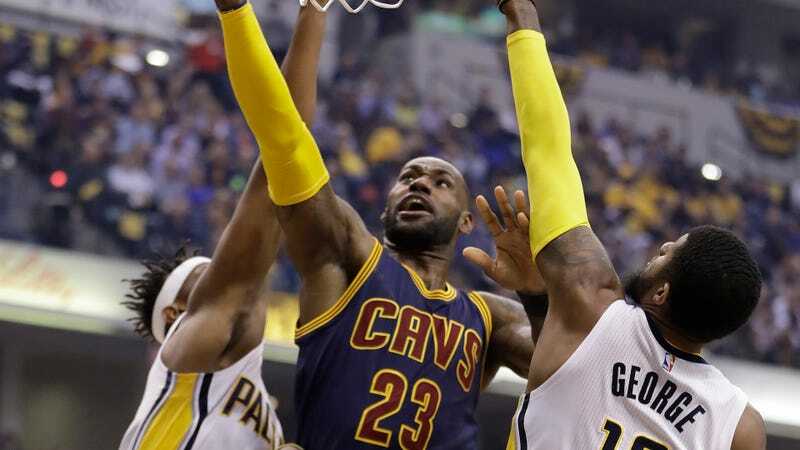 After trailing the Cavaliers for most of today, the Pacers managed to come back and tie Game 4 with two and a half minutes remaining before taking their first second-half lead on a Thaddeus Young tip shot with 1:30 left—but LeBron answered with his first and only three-pointer of the game, and Indiana’s chances evaporated from there. After a pair of successful free throws for the Cavs, the Pacers found themselves down by three with 19 seconds to play. And then came what could be Paul George’s last series of plays as a Pacer, which were very fitting in that they were very frustrating: an Indiana turnover as George slipped, which ended up back with George as J.R. Smith botched a pointlessly showy behind-the-back pass, which then bounced off the backboard as his last-second attempt to tie the game failed. The sweep means plenty of rest for the Cavs, who face the winner of Bucks-Raptors, which will go at least six games.